It's cherry season again! When I went into town yesterday lunchtime I spotted cherries on the fruit and veg stall and had to buy a pound. I only stop at the stall in cherry season but the owner recognises me and knows exactly what I want! I had a smile on my face all the way down the road after I bought them. Last year's crop was excellent so I hope this year's will be just as good. In season I eat a pound a day whenever I get the chance to buy them. My daughter's given up trying to claim one or two and just leaves them all to me. 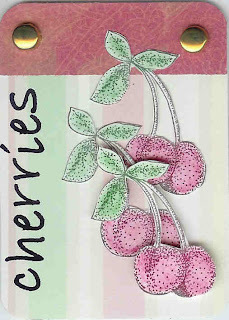 Here's an ATC I made last year in homage to cherries - it's an image I use over and over again.